An extensive storage system plays a critical role in the state’s water management. 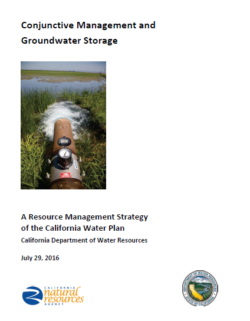 This brief describes a number of ways to improve the management of reservoirs and groundwater basins to better prepare for droughts and manage floods. Conjunctive management or conjunctive use refers to the coordinated and planned use and management of both surface water and groundwater resources to maximize the availability and reliability of water supplies in a region to meet various management objectives. Surface water and groundwater resources typically differ significantly in their availability, quality, management needs, and development and use costs. Managing both resources together, rather than in isolation, allows water managers to use the advantages of both resources for maximum benefit. Conjunctive management thus involves the efficient use of both resources through the planned and managed operation of a groundwater basin and a surface water storage system combined through a coordinated conveyance infrastructure. Water is stored in the groundwater basin that is planned to be used later by intentionally recharging the basin when excess water supply is available, for example, during years of above-average surface water supply or through the use of recycled water. The necessity and benefit of conjunctive water management are apparent when surface water and groundwater are hydraulically connected. Well-planned conjunctive management that prevents groundwater depletion by maintaining baseflow to streams and support for ecosystem services not only increases the reliability and the overall amount of water supply in a region, but also provides other benefits such as flood management, environmental water use, and water quality improvement. An alphabetical listing by county of dams within the jurisdiction of the state of California. 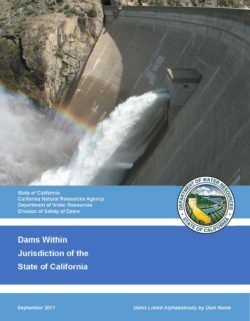 An alphabetical listing of dams by dam name within the jurisdiction of the state of California. 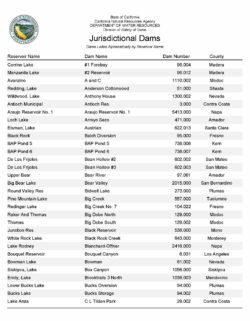 An alphabetical listing of dams by reservoir name within the jurisdiction of the state of California. Surface water and groundwater management are often tightly linked, even when linkage is not intended or expected. This link is especially common in semi-arid regions, such as California. 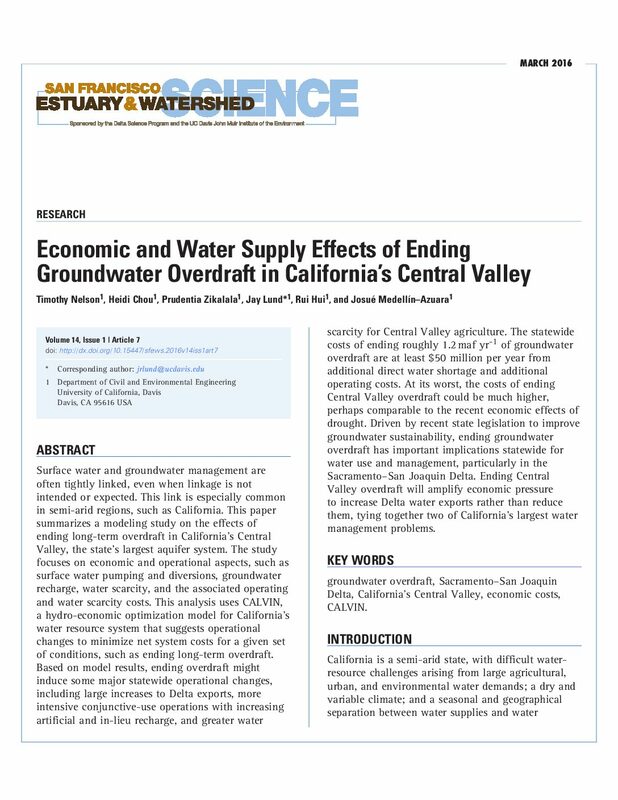 This paper summarizes a modeling study on the effects of ending long-term overdraft in California’s Central Valley, the state’s largest aquifer system. The study focuses on economic and operational aspects, such as surface water pumping and diversions, groundwater recharge, water scarcity, and the associated operating and water scarcity costs. This analysis uses CALVIN, a hydro-economic optimization model for California’s water resource system that suggests operational changes to minimize net system costs for a given set of conditions, such as ending long-term overdraft. Based on model results, ending overdraft might induce some major statewide operational changes, including large increases to Delta exports, more intensive conjunctive-use operations with increasing artificial and in-lieu recharge, and greater water scarcity for Central Valley agriculture. 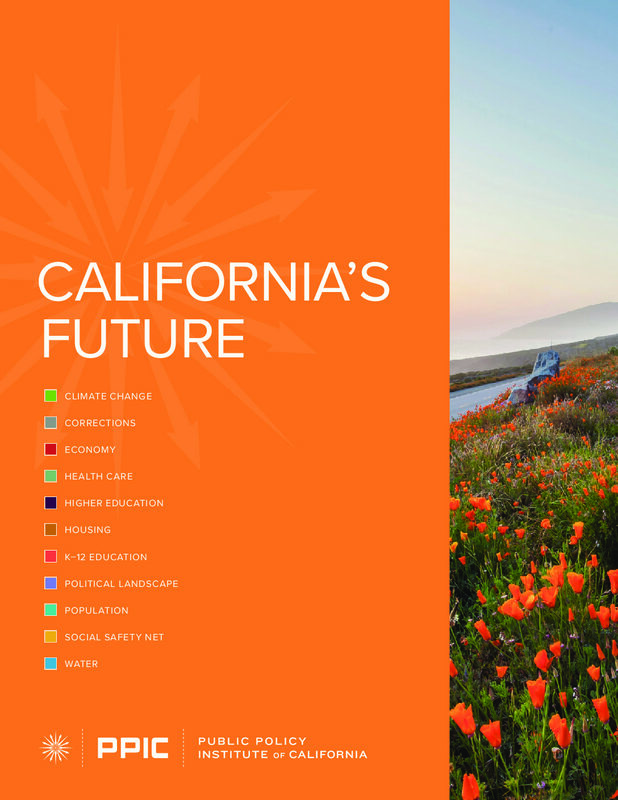 The statewide costs of ending roughly 1.2 maf yr of groundwater overdraft are at least $50 million per year from additional direct water shortage and additional operating costs. At its worst, the costs of ending Central Valley overdraft could be much higher, perhaps comparable to the recent economic effects of drought. 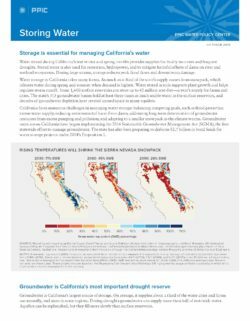 Driven by recent state legislation to improve groundwater sustainability, ending groundwater overdraft has important implications statewide for water use and management, particularly in the Sacramento–San Joaquin Delta. Ending Central Valley overdraft will amplify economic pressure to increase Delta water exports rather than reduce them, tying together two of California’s largest water management problems. In the San Joaquin Valley, California, recent droughts starting in 2007 have increased the pumping of groundwater, leading to widespread subsidence. 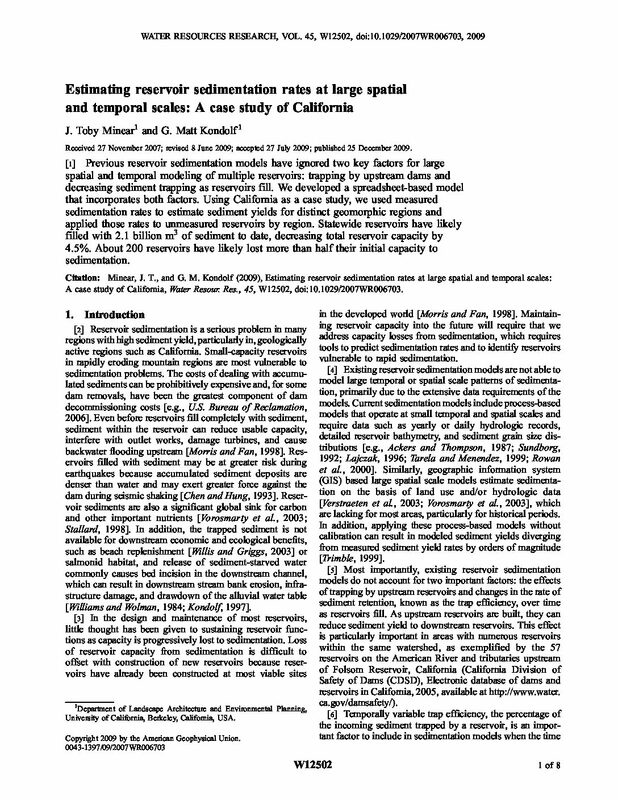 In the southern portion of the San Joaquin Valley, vertical subsidence as high as 85 cm has been observed between June 2007 and December 2010 using Interferometric Synthetic Aperture Radar (InSAR). 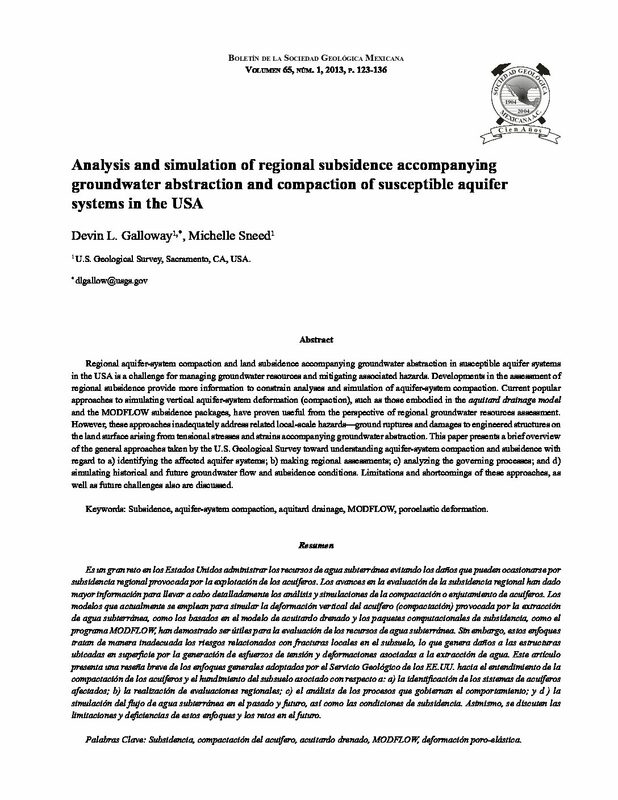 This study seeks to map regions where inelastic (not recoverable) deformation occurred during the study period, resulting in permanent compaction and loss of groundwater storage. We estimated the amount of permanent compaction by incorporating multiple data sets: the total deformation derived from InSAR, estimated skeletal-specific storage and hydraulic parameters, geologic information, and measured water levels during our study period. We used two approaches, one that we consider to provide an estimate of the lowest possible amount of inelastic deformation, and one that provides a more reasonable estimate. These two approaches resulted in a spatial distribution of values for the percentage of the total deformation that was inelastic, with the former estimating a spatially averaged value of 54%, and the latter a spatially averaged value of 98%. The former corresponds to the permanent loss of m3 of groundwater storage, or roughly 5% of the volume of groundwater used over the study time period; the latter corresponds to the loss of m3 of groundwater storage, or roughly 9% of the volume of groundwater used. 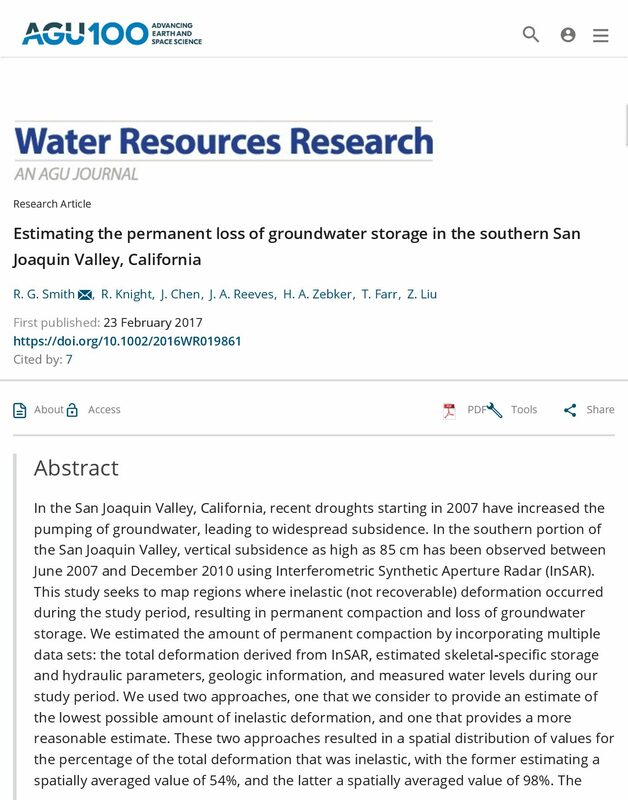 This study demonstrates that a data-driven approach can be used effectively to estimate the permanent loss of groundwater storage.